Stephen Kelly of Clare in action against Kieran Russell of Limerick during their Oscar Traynor game at Frank Healy Park. Photograph by John Kelly. 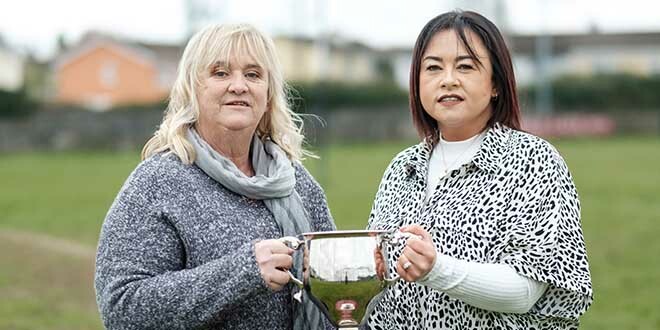 THERE was drama in Frank Healy Park this Wednesday night, when the floodlights failed early in the second period of extra-time of this Oscar Traynor clash, with Clare ahead by 2-1. At the full-time whistle, Clare and Limerick were dead-locked at 1-1 each, meaning extra time was required. In the first minute of the second period of extra-time, Clare went in front with a Derek Fahy goal, following a Dylan Casey corner. Two minutes later the floodlights failed and the referee took both teams off the field. Visitors Limerick were full-value for their 1-0 half-time lead, as they had the better of the first half exchanges and could have been further ahead at that stage. Limerick took the game to their opponents from the off. They were without the Pike Rovers players, who were withdrawn to concentrate on the club’s FAI Cup campaign and this seemed to spur on those who were on duty. They were clearly determined to end the champions’ involvement in this season’s competition. Adding further to the interest in the tie was the involvement of Sixmilebridge man, John Mulready, who lined out in goals for Limerick. 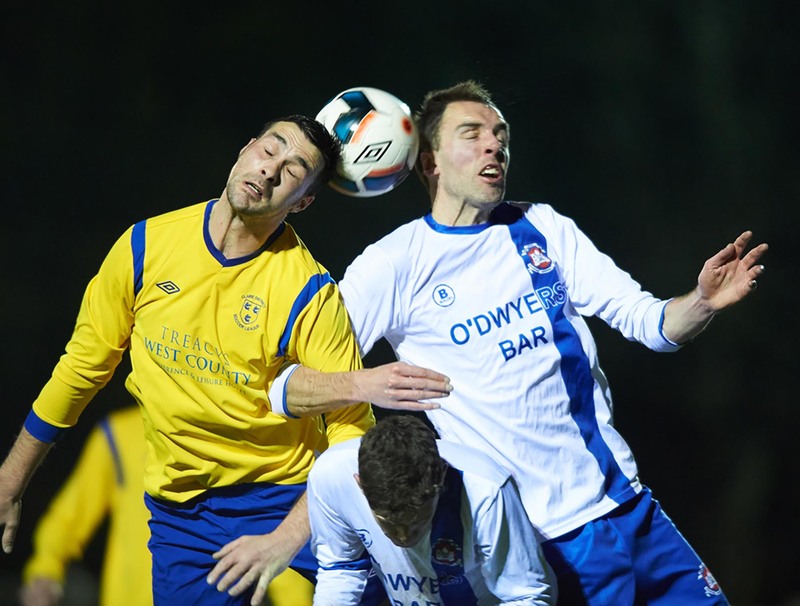 He is a former Bridge United and Clare goalkeeper but now plays his football with Janesboro. His deputy on the night was Rob Shire, who formerly played with Newmarket Celtic. The Clare back-line seemed unsettled and had a couple of narrow escapes before they fell behind in the 19th minute. A corner from Darragh Rainsford wasn’t dealt with and Tom Clarke fired a shot goalwards, which was adjudged by the match officials to have crossed the line. Clare had a couple of chances towards the end of the half and there were calls for a penalty but Clarke’s goal still separated the sides at the break. There was more urgency shown by Clare on the resumption, as they piled on the pressure. This paid off on 17 minutes, when Tommy McKeown played the ball through and Derek Fahy’s challenge for possession caused problems for the visitors. The ball deflected past Fahy’s former Bridge United clubmate, John Mulready, who was shown a yellow card by the referee arising from this clash. Both sides had chances in the final 20 minutes, with the last of these falling to Clare shortly before the whistle, but Mulready saved a Dave McCarthy free. Clare: Barry Ryan (Avenue United); Stephen Carroll (Shannon Town), Dylan Casey (Avenue United), Eoin O’Brien (Newmarket Celtic), Stephen Kelly (Newmarket Celtic, captain), Colin Ryan (Newmarket Celtic), Derek Fahy (Bridge United), Colin Smyth (Newmarket Celtic), Eoin Hayes (Newmarket Celtic), David McCarthy (Newmarket Celtic), Tom my McKeown (Tulla United). Limerick: Jon Mulready; Danny O’Neill, Jon Somers, Tom Clarke (captain), Dermot Fitzgerald, Aidan Hurley, Darragh Rainsford, Kieran O’Connell, Shane Clarke; Conor Kavanagh, Eoin Patterson. Referee: Shane Hayes; Linesmen: Michael Rock and Trevor White.